At first it sounded like hail the rain was pouring so hard. The sky was lit up all around us with lightning firing off every few seconds. A storm of biblical proportions and all I could think about was hoping the bass would be biting in a few hours and that I could maybe get some more rest. Awake again fifteen minutes before the alarm and it was clear we wouldn't be launching the boat just yet. Another hour passed and the rain began to recede becoming almost suitable to fish in. 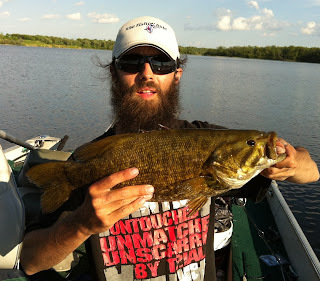 While Jay prepped the boat I couldn't help but fish the dock, missing a bite on my first cast only to get a solid hook up on the second one. 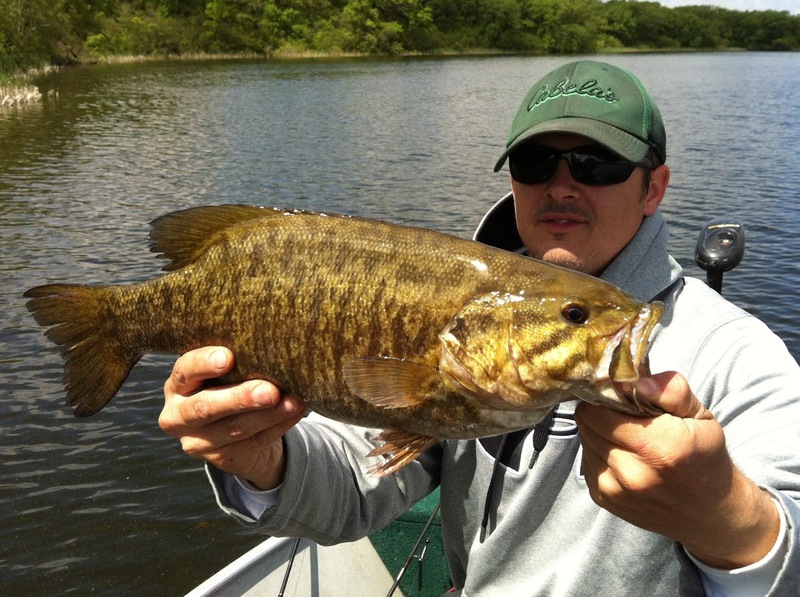 A nice 16 inch Smallmouth made it to shore and the expectations for the day were instantly raised. If one would bite after a storm like that, we were all sure we could get some others to do the same. The rain was peppering the waters surface and wind kicking up some small chop as we headed to our first planned spot. It was slightly sheltered from the winds current direction and looked a little bassy. The plan was to each use different lures to try and figure out what would work best and hopefully land some sow smallies. After a few casts the first one hit and made it to the boat. Frodo the Bass Slayer, as he was soon to be named boated the first one over 18 inches of the day. I followed up with a bite off, the Pike seemed to have followed me over from the previous day but I wasn't deterred. The weeds in this bay were so thick and essentially made top water lures the best option and after a few feisty pike to the boat we decided to head on to another shore line. Over a few trips smallie fishing I have lost more bass than I would care to admit. 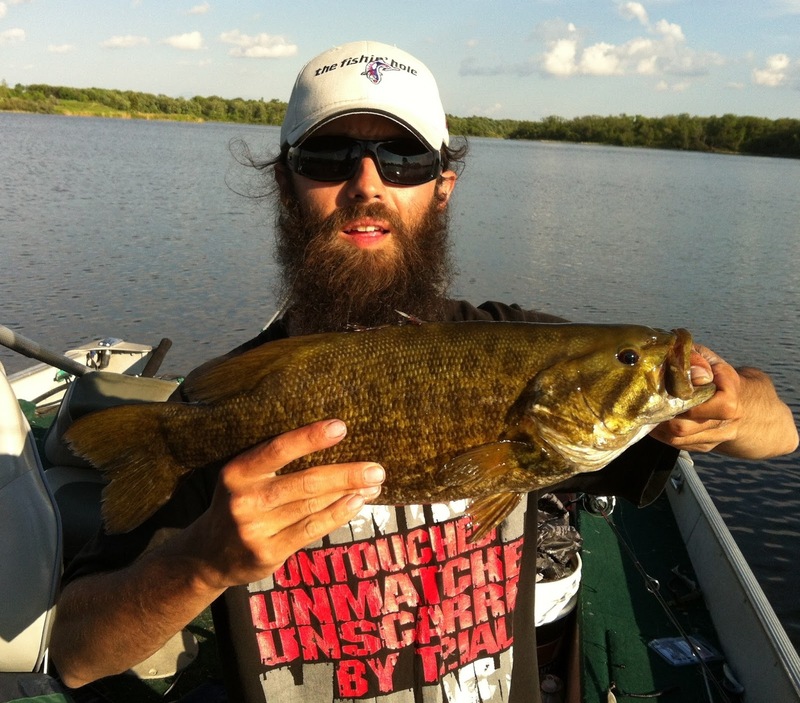 Manitoba has a barbless hook regulation and Bass are notorious for shaking that hook. Line would go slack and time would slow as a brute would breach the surface thrashing its head trying to shake the hook. Rarely was I able to maintain a tight line from shore when this would happen, half the time losing a fish. I took to burying my rod tip in the water when I would have a bass on whenever a shore spot would permit and carrying this tactic to the kayak and boat. A lot of the time it would prevent a good amount of out of water leaps and lead to more "bulldogging" to the bottom by the bass. I credit this partially to my level of success this day. Patches of blue sky to the west and the bass were biting, we had brought a few to the boat at this point and I was able to finally land one of many over 18 inches of the day. After countless trips, hook sets, breaches and shakes I had finally done it. I was filled with joy and knew there were many more hours in the day to try for more. We fished on continuing to try different lures and techniques changing up if no bites were had after a dozen or so casts. I was able to get a few hits on the new Shadow Raps but no hook ups as I tend to favor finesse jigging over retrieve cranks, they obviously get less practice. But that will continue to change as my techniques evolve. The wind really couldn't make up its mind changing directions frequently throughout the day. This opened up new sheltered areas to fish and provided light chop on others. All in all we mostly kept chucking what the fish seemed to want to bite. No one checked the time until around noon, at that point we all thought it was closer to supper and were stoked there were many more hours to fish. 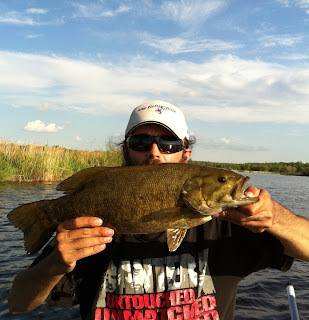 As the sun finally broke through the fishing only picked up with the bass seeming to get even more aggressive. Plenty of top water strikes and hook ups for Frodo made the day even more exciting as I would slowly pitch and jig while watching his lifelike lure. Time passed so slowly as the sun crept along making the days fishing even more enjoyable. We started in many layers of clothing and raingear and ended the day in t shirts. Many bites were missed and fish lost however one thing I did pick up on was slowing down after a missed bite and waiting for a second chance from an already interested fish. That second chance was given more often than not and the fight was on. 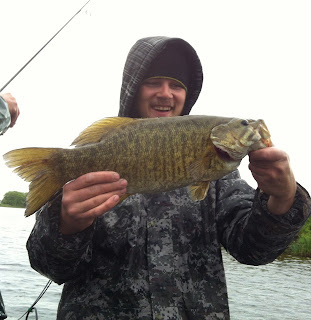 For their size, Smallmouth Bass are some of the toughest fighting fish our province has to offer and we were loving the action they provided. As the evening came we knew it was getting near our departure time so we hit the two most productive spots of the day once more. My last fish ended up being a personal best 19.5 inches and I was truly content with the days events. The numbers were unbelievable, weather unpredictable and a trip that far exceeded our expectations was in the books.